 By Reservation Only with The California Wine Club! The California Wine Club's By Reservation Program gives you access to the wines you want with no commitment and no obligation! Following up on last week's discussion about rising alcohol levels, we discover that excellence involves more than just rational ethanol content. Fresh and crisp, some Pinot varietal character, but this modest Oregon item is on the simple and rustic side for Pinot Noir.  By Reservation Only with The California Wine Club! The California Wine Club's By Reservation Program gives you access to the wines you want with no commitment and no obligation! From writer David Dibbern, 10 great wines to try before you die; and we'll take on any wine question in a "Wildcard Q&A" on next Saturday's Internet Radio TalkShoe. In our forums, we're studying the German system for classifying wines, and taking a poll on whether wine companies should self-censor advertising to protect children. Last week, unburdening myself of a much-needed rant, I spent a little time sermonizing about the wine-industry trend toward more and more powerfully alcoholic wines in recent years. Without rendering an absolute judgment over whether this is the result of advancing yeast technology, changing climate or pressure to win ratings points from critics who like blockbuster wines (actually, I think it's a combination), I took a fairly strong stand against it. Today, writing from the Orlando airport as we return home from a short visit with family, let's revisit the topic briefly for a quick look at a couple of exceptions to the general rule. First, a point that I could have made more clearly last week: I find the overall trend toward higher alcohol levels objectionable when the octane boost changes the character of traditional wine styles that I love. No 15 percent Pinot Noir or 16.5 percent Chianti, please! But this should not be interpreted as saying that I don't enjoy high-alcohol wines when it's appropriate. Port is splendid at 20 percent. Sherry and Madeira and other fortified dessert wines can be excellent in the 18 to 20 percent range. And I wouldn't even turn down a well-made 15 percent Turley Zinfandel. Indeed, I've frequently praised many of California's top-tier wines even with alcohol at levels that once seemed stunning. But there are two keys to success in this risky realm: First, these potent potations aren't trying to represent traditional styles; they're new-wave wines that set their own paradigms rather than brusquely shifting old ones. More important still, they are well-made, balanced wines that play their alcohol (and, often, their oak) as part of a harmonious chorus, not merely loud voices trying to out-shout the rest. That's key No. 1. Here's No. 2: Rational alcohol levels aren't sufficient in and of themselves to yield a wine of excellence. I submit today's tasting (notes below) in evidence of this hypothesis. 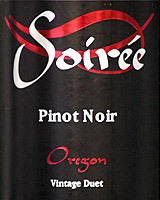 An Oregon Pinot Noir with an unfamiliar label (it's a "negociant-style" wine made of purchased grapes or wine by a distributor), it caught my attention on the retail shelf because its alcohol content appeared rational at 13.5 percent, so it seemed worth a try. Indeed, it's not a bad wine. But it's not particularly long on varietal character and doesn't ring my chimes in any compelling way in spite of its admirably appropriate alcohol. Considering its price in the low teens, I don't feel ripped off in any way. But I'd be more forgiving of its generic style and rustic edges if I'd paid well under $10 for it. Moral of today's story: Reasonable alcohol is usually a good thing. But it's not the only thing. FOOD MATCH: Even a low-end Pinot Noir is a versatile and food-friendly wine capable of matching with a broad range of fare from red meat to cheese to poultry, pork or fatty fish ... particularly salmon. We went the classic route with fresh local beef (grass-fed rib eyes from Fiedler Farm in Indiana), pepper-crusted and pan-seared medium-rare. VALUE: I'd call it a fine bargain as an under-$10 dinner wine, and realistically it's not out of line with the competition for New World Pinot at this price point, where, sadly, you can expect something more suited for burgers than steak. That's not a criticism of this wine, just a statement of modern economic reality. WHEN TO DRINK: Even modest Pinot can generally support a little age, but this one's really intended to enjoy in the short term. There's surprisingly little information available about this wine online. The national distributor, Low Country Imports, has a short page at this link, but I can't make the information popup therein open up in either Firefox or Internet Explorer. If you have better luck, please let me know! By Reservation Only with The California Wine Club! Many of California's highest-rated and most coveted wines sell out before countless wine consumers ever have the chance to purchase even a bottle. Wines like these can be difficult even for The California Wine Club to find. In fact, we sometimes acquire so few cases, we are unable to feature them in the club and instead offer them to a select group of customers.  When a very special or limited wine opportunity comes up, we will automatically reserve a case for you.  Once your case has been reserved we will notify you via email. At that time, you can choose to accept or withdraw your reservation. To add your name to the By Reservation Only Program, simply call 1-800-777-4443 or email info@cawineclub.com and let us know you'd like to participate. It's The California Wine Club's By Reservation Only Program - the wine you want with no commitment and no obligation! Forthwith we will consider 10 wines, more or less, that at least one wine aficionado - columnist Donald A. Dibbern, to be exact - hopes to have on his life list before shuffling off this mortal coil. Got a question, any question, about wine? Come and ask our expert panel on the next Internet Radio TalkShoe on Saturday, Aug 4, at 1 p.m. US EDT (10 a.m. on the U.S. West Coast and 19:00 in Western Europe). In association with his excellent Saturday "TalkShoe" presentation, David Bueker is leading an informative discussion on German wine in our WineLovers Discussion Group.  Netscape/Compuserve Community Poll: Censor wine ads to protect children? The Disney studios recently announced that it was backing out of a deal to market a French Chardonnay under a "Ratatouille" label, featuring characters and design from Disney/Pixar's animated movie. What do you think? Is the concern of exposing children to information about alcoholic beverages serious enough to justify self-censorship? Or should the people who worry about children taking a drink be advised to police their own offspring and stop worrying about what other people do? Tell us your opinion in the CompuServe/Netscape forum poll!